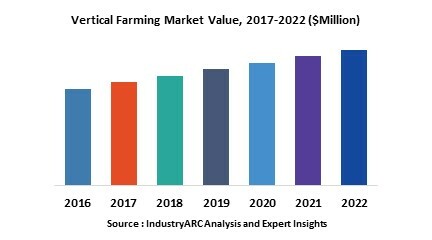 The Vertical Farming market is expected to grow at a CAGR of 25% during the forecast period i.e. 2018-2023. The vertical farming has transform the modern agricultural practice with its modern automation to produce the good quality of nutritious food while reducing the cost and consumption of harmful chemicals products. Majority of the revenue is contributed by the region Asia pacific in 2017. Vertical farming allows Small and Medium Scale enterprises to deliver their products confidently as it reduce the spoilage and cost effective that’s predicts to strengthen the future of vertical farming and its dominance through the forecast period 2018-2023. Vertical farming is a process of planting or growing the plants in horizontal stacked layer. Vertical farming use various techniques such as hydroponics, Aeroponics, Aquaponics. In Hydroponics technique plants are grown without soil, using the mineral nutrient solutions in water solvent. The nutrient in hydroponics can be fish waste, duck waste or normal nutrient. In Aquaponics methods aquatic animals such as snail, fish, and prawns in tank are combine with the Hydroponics system where plants get the nutrients and water is then recirculated to the aquatic animals. Aeroponics is the process where pants are grown in air or mist environment without the use of soil. Vertical farming is highly beneficial to cultivate crops in bare, arid land etc. it is difficult to grow plants in such places, hence vertical farming so this challenge helps the mountains, unfertile land, and cities to grow different types of vegetables, fruits, flower by using various structure like Indoors, rooftop, Building. What are the major applications for Vertical Farming? The various end users assessed include home, small and medium businesses, agricultural. Vertical farming can be used in home to grow plants through Hydroponics method. To the industries vertical farming benefits in several ways. Small and medium business grow their business with the trending business of vertical farming. The companies are investing huge capital into research and innovation to make sure they are sustainable in the competitive market food production. Several major player who are focusing to expand their business through innovative technology. Since the vertical farming is the latest innovation in the crop production it reinvent the modern farming practices. The vertical farming is declining the volume of traditional agriculture and raise the demand for the organic food internationally. Vertical Farming Environment is protected with the Bio- security that prevents the diseases and insects attacks on crop that terminate the need of the pesticides, herbicides, foliar sprays etc. and it gives the results in short time hence the vertical farming is cost efficient and decreases the use of chemical products thus, its boost the vertical farming market. Who are the Major Players in Vertical Farming market? The companies referred in the market research report includes Sky Greens, Aero Farms, Green Sense Farms, Hort Americas, illumitex, Urban Crop Solutions, Indoor harvest and more than 10 other companies.